My inspiration comes from the first UN Volunteers I met in Darfur. They often live far from home and in some cases, serve in hostile situations. Through them I see that everyone should work daily to support and maintain peace. My model is the United Nations with all its volunteers and their great ideas. My name is Ouedraogo Mohamadi. 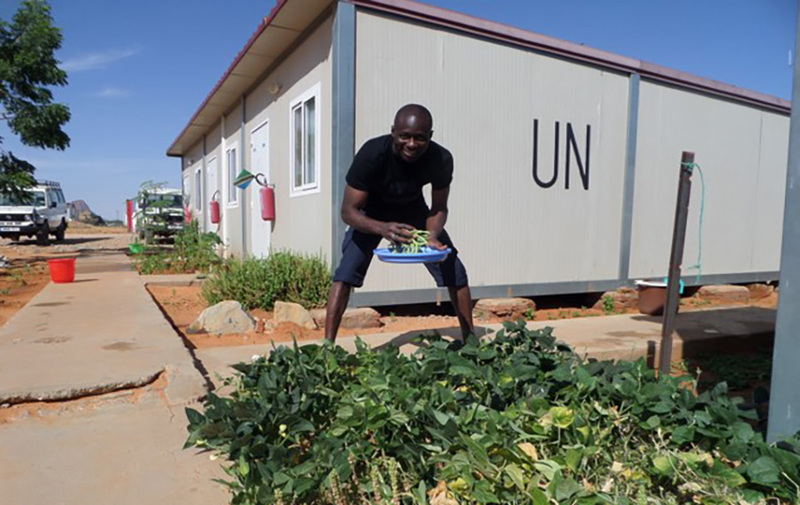 I am an international UN Volunteer working as an information analyst at the Joint Mission Analysis Centre (JMAC) of the United Nations Multidimensional Integrated Stabilization Mission in Mali (MINUSMA). I started in Kidal but now work in Gao, Northern Mali. My role is to collect and analyse data as part of MINUSMA's mandate. I also assist the Head of the Mission in Gao. I help ensure that the mission's mandate is carried out. My first contact with a UN Volunteer was in 2013, when I came to Mellit, north of El-Fasher, in Darfur. His name was Obinya Kobinya. He gave me a lot of information on UN Volunteers and told me about his extensive experience serving as one. That is when I discovered that volunteerism offered a good source of professionals with various backgrounds who are ready to serve and help people cope with the various issues they face. I immediately became interested and created my profile. That is how, in March, I found myself in Nyala in the south of Darfur, with the United Nations Police (UNPOL). Before becoming a UN Volunteer, I worked for two years for UNPOL with the African Union-United Nations Hybrid Mission in Darfur (UNAMID). By becoming a UN Volunteer, I was simply continuing this experience. I have a Masters in Public Law, as well as a university diploma in Francophonie, New Economy and Sustainable Development. I have attended many professional training sessions, seminars and conferences in several countries, such as Germany, Norway and Ghana. I have 15 years of experience in security and justice related to violence against women and girls, including female genital mutilation. The work we do is often risky and at times very dangerous, but it is necessary—the region is prone to terrorist attacks. That is why, I immediately formed with my peers a group of UN Volunteers in Gao to show our solidarity with the victims of the deadly terrorist attack of 18 January against the Mécanisme Opérationnel de Coordination (MOC) in Gao. Always united as a family, we gathered our contributions—including blood—to express our solidarity. It was much appreciated by the people of Gao, the victims and our colleagues at the national and international levels. My role was to show my solidarity, together with my colleagues, to once again prove to others that we are truly inspiration in action. I have an unusual career. As indicated in my 2017 volunteer assessment, I always want to learn, to improve my skill sets and to provide quality work. I am always trying to achieve excellence and satisfy my supervisors. In this context, volunteerism is both professionally and personally enriching. It motivates us to become better people. We do not exist in isolation, so being with others means we should be willing to help and assist one another; to do so voluntarily. Helping people around us can only make us feel proud and good about ourselves. That is the essence of humanity, of life.